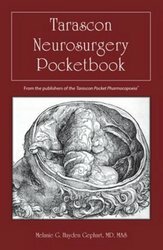 The Tarascon Neurosurgery Pocketbook brings neurologists, neurosurgeons and residents the most convenient and comprehensive pocket reference available today. This concise, organized pocket guide is packed with essential lists, figures, & tables providing instant reminders of hard-to-remember, vital clinical information. This pocket reference guide covers neurosurgery topics including brain tumors, and a comprehensive section on neuropharmacology. No other Neurologic reference of this kind incorporates neurosurgery, neurology and neuro-critical care in one reference. The Tarascon Neurosurgery Pocketbook is an unmatched resource for neurosurgeons and trainees.